VietNamNet Bridge – Owing to its poor performance at the last two Southeast Asia Football Cup (AFF Cup), Vietnam ranks sixth and almost has to attend the AFF Cup 2014 qualifying round. Because of heavy failure in the 2012 AFF Cup, Vietnam is no longer a seed team. Photo: DNSG. At the upcoming AFF Cup, Vietnam and Singapore will host games of the two groups, including eight teams. The six top teams will be headed straight into the next stage while the other teams will have to participate in the qualifying round to select the two teams for the next round. Based on the performance of the participating teams in the last two AFF Cups, the Southeast Asia Football Federation (AFF) ranked the teams for the draw. According to the rankings, Vietnam is at the sixth position, with 15 points, behind Malaysia (20 points), Singapore (18 points), the Philippines (18 points), Indonesia (17 points) and Thailand (16 points). The five teams stand behind Vietnam will have to compete in the qualifying round in Laos, including Myanmar (11 points), Laos (11 points), East Timor (5 points), Brunei (4 points) and Cambodia (4 points). 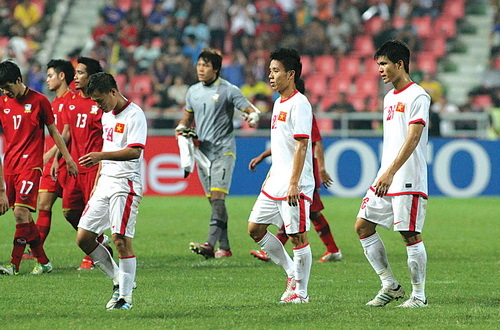 At the AFF Cup 2010, Vietnam moved into the semifinals but in the next two tournaments, the team stopped in the first round. Thus, Vietnam will not be the seed at the 2014 competition so it may face strong competitors such as Thailand and Malaysia in the first round. The qualifying wild is scheduled from October 8, to 19, 2014 and the finals will take place from November 22 to December 20, 2014. The draw may take place in July 2014. AFF Cup 2014 may be the last tournament held in the form of concentration in two countries. The current trend is organizing games at home and guest countries in order to increase the attractiveness. The AFF recently recognized Australia as its official member and this country will take part in the region’s football event from next year.